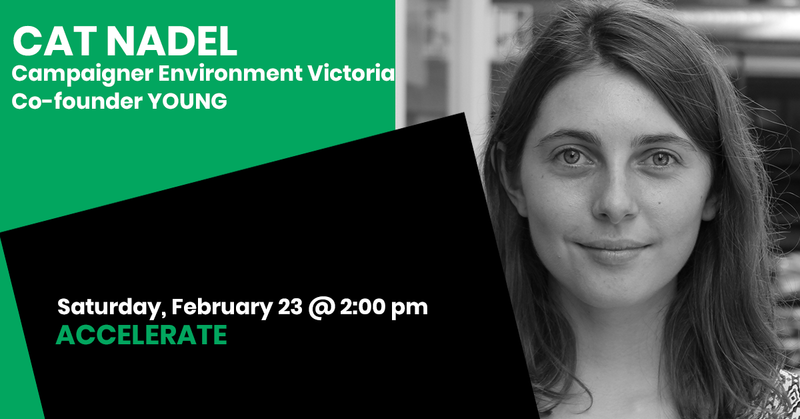 Cat Nadel is a campaigner at Environment Victoria where she leads campaigns for climate justice. Cat works with a team of organisers, volunteer leaders and grassroots activists to grow the movement of people fighting for a safe climate and just transition in Victoria. In her time at Environment Victoria Cat has worked on the campaign to retire Hazelwood – the dirtiest coal burning power station in Australia – and supported solidarity campaigns for transition funding and worker support in the Latrobe Valley. Last year Cat worked with the SAVE WESTERNPORT local group to coordinate the STOP AGL campaign, mobilising community support against a gas import terminal proposed for development in Westernport Bay. She also drove EV’s state election campaign in Bentleigh and Mordialloc to ensure the Victorian Government was elected with a strong mandate to stand up for the climate. Cat first cut her teeth in campaigning while still at university where she led the student powered campaign for Monash University to divest from coal. She has previously worked for Oaktree, on the Roadtrip to End Poverty and as National Operations Manager during the 2013 federal election. Cat is also a co-founder of a new youth economic justice campaigning organisation called YOUNG.